My spouse and I arrive in Montreal. Our year-long drinking journey begins here. Europe will become the core of our trip. But we like Canada, it is close, and we want to see the Maritimes: Canada’s East Coast. Already familiar with the bustling Montreal metropolis and their province-controlled wine store, SAQ (click here for my review), we go shopping. Tragedy. 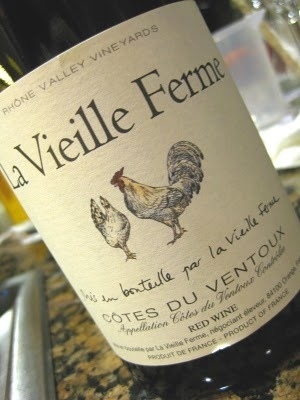 La Vieille Ferme rouge, my go to French red for under $8, sits on the shelf at $14. After a bit of rage, denial, and searching for alternatives, the heavy Canadian penny drops. We forgot that tax is 15%. Without competition under communism, prices are whatever a comrade is willing to pay. Tariffs on imports are high and selection controlled by an elite committee. So we make a pact. If no local made it, don’t drink it. We can learn how Chilean pinot noir tastes anywhere. No one sells Quebec wine in the states (no one sane at least). When else might we drink something from the same soil, weather, water and culture as that cheese and bread? Some harmony must exist between flavors and textures derived, and then produced, from similar means and for similar ends. This comes from vineyards thirty minutes outside of Montreal. Rivière du Chene is Quebec’s largest producer and it shows: their wines are everywhere. 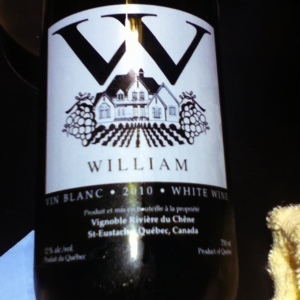 Tonight’s white is called William. Yup. Just William. Why such vine hanky panky? Well, vandal-cliche can handle -31F. That’s freakishly cold for a plant from the eastern Mediterranean. Rivière du Chene grows it near the St Lawrence river, along the 45th parallel, all of which, they claim contributes to a climate similar to Marbolrough New Zealand. Sure. Bottle open, the wine is a clear, thin lemon color. 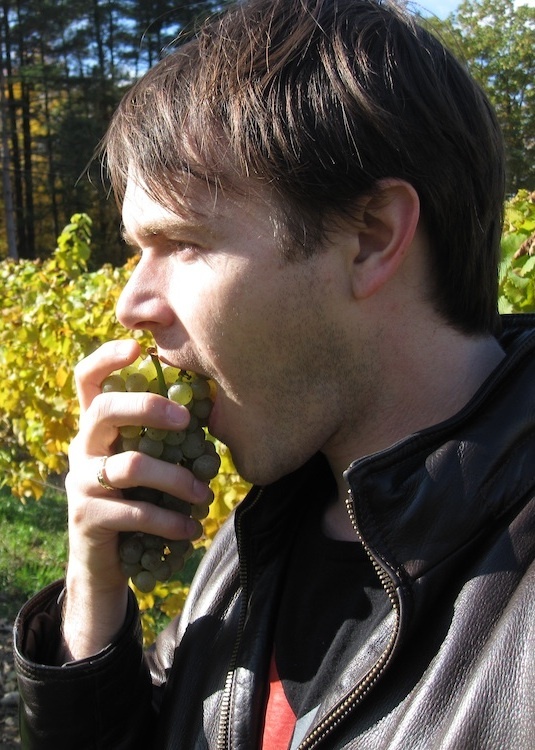 The bouquet is clean with medium intense green apple peel, yeast, and young green grapes. No sugar survives the screeching high acid. So I’ll call it dry. Acid lightens any body or core fruit. Even with malolactic fermentation and lees stirring (which should soften the acidity) William barks its cold climate credentials. The flavors are fairly average dry white: with citrus rind, pith, lemon juice, water, steel. The length is medium minus. This is acceptable quality but a bit dear at $15. It’s a wine. Zippy and ready for some zingy boucheron cheese from here or their crisp cucumbers (hot house vegetables didn’t work, nor anything sweet). 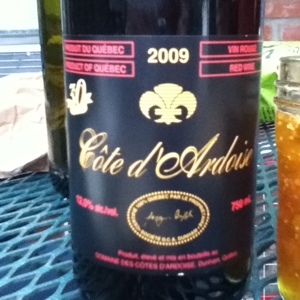 From Quebec’s biggest producer to their oldest, Domaine Des Cotes D’Ardoise. After forty years, Ardoise should know what to do with their 2009 Vin Rouge. The main grape is gamay noir of Beaujolais fame (and infamy). It is one of the few European red varieties that survive Canada’s cold. Ardoise grows Quebec’s oldest vines (25 years) for this wine, just North of Vermont, where the St Lawrence warms as well but continentality increases, making winters and summers more extreme. What does this all mean? Try it. It is odd. If you’ve tried any cool climate red you’ll understand. Five years show in the garnet color. The nose says drink me now. Oaky, nutmeg, and musk tones dominate the fruit. I’d like to claim cherry but dried tomatoes seem more apt. Rustic. The palate is dry, tough, yet bright. Acidity reigns supreme. There’s a hint of volatile acidity. Nothing offensive though. Gamay’s typical lower tannins and medium body barely hold candle to the obvious oak notes, that carry a burnt, lacquer-like quality. Primary fruits again seem underripe. Tart blackberry, red apple skin are all you get. The finish drops off awfully quickly. Annoyingly, a few glasses in, Ardoise tastes like a musky, over-oaked beaujolais. Blue or smoked cheeses may save it. It’s unique and of acceptable quality, but $16? Seriously? Final chance Quebec. Maybe grapes are too much a stretch. Apples, you are up. La Face Cachée’s first sparkling cider comes in a slick package, labeled simply Bulle No 1. Brut. Quality photography like this has no price. The cork is caged for a good reason: this is intense fizz. After the apples turned to a still wine around 6% alcohol, the cider was treated like champagne. Bottle refermentation raised the alcohol to 7.5 and added proper CO2, no soda carbonating here. It’s so fizzy, I would advise decanting it. Coupled with trademark high acid and no residual sugar, the big bubbles will sear the palate. Fish and chips are in order. Yet Bulle No. 1 works. 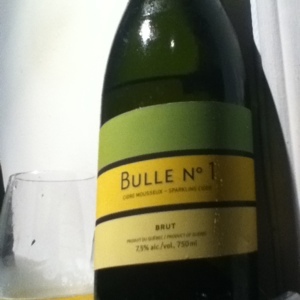 It’s clean, clear, pale and refreshing on a dry Cava kind of level. The citrus flavors and nutmeg-like yeastiness say hi in a chirrup and run off. This is what appetizers and a crew who doesn’t care about the drink want. Quebec’s strong suit may not fit a mid priced wine body. They’re real, indicative of the climate, and interesting. But I’m barking up the wrong vine. Next week, a vine of a hoppier kind: Québécois craft beer. This entry was posted in Uncategorized and tagged cold climate, Quebec. Bookmark the permalink. Reading that musk was noted early on set a red flag. Do they have wine bars there, and is there a bit of grimacing, or are their meals adapted to the wine? The musk kinda works, just takes acclimating to. There are tons of wine bars and super clever chefs working pairings. We’re too poor to find out and keep this trip moving however.